Newly elected Edinburg CISD school board member Letty Garcia is sworn in by Hidalgo County Judge Ramon Garcia at the ECISD Administration board room on Thursday, Nov.15, 2018, in Edinburg. Garcia is joined by her mother Angelica Gonzalez Garcia and her children. 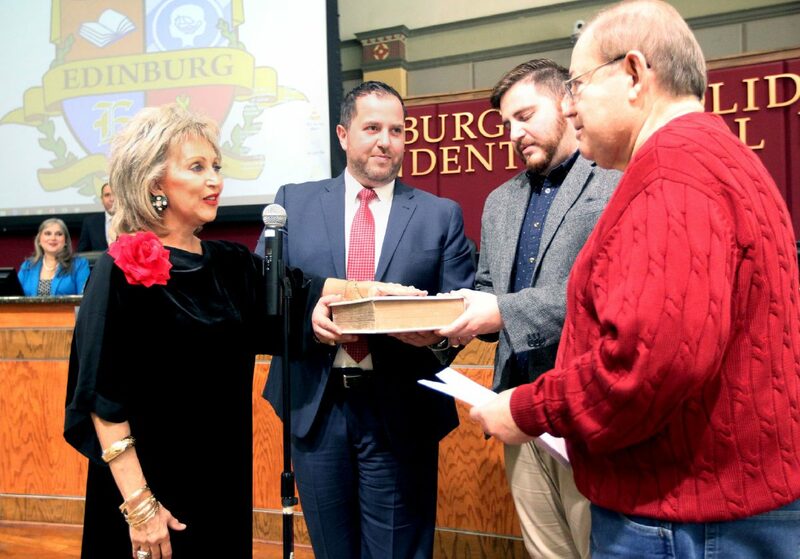 The Edinburg school district board room filled to capacity Thursday afternoon during a special meeting intended to swear-in newly elected trustees, bid farewell to those leaving and reorganize the board officers. Trustee Robert Peña was elected board president, Carmen Salinas remains as vice president and Oscar Salinas will serve secretary of the board. Two new female trustees also joined the board after a successful campaign and election, Dominga “Minga” Vela on Place 1 and Letty Garcia on Place 3. This is a first for Garcia, an employee for Hidalgo County, who won the election against Steven Cruz with 63.5 percent of votes. She was praised by Torres as the perfect candidate to take over her seat. Torres didn’t seek her place on the board as she was recently elected to serve as Hidalgo County Commissioner. New trustee and lifelong Edinburg educator Vela won the election with 53.5 percent of votes against Juan “Sonny” Palacios. After taking her oath of office she echoed her intention of working together to maintain high achievement within the entire district as well as high standards. 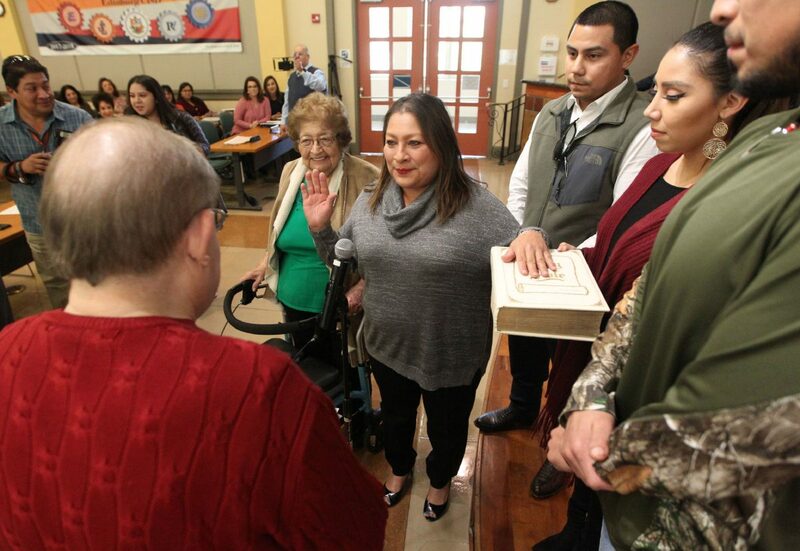 Garcia had the opportunity to be sworn in by her bother, Hidalgo County Judge Ramon Garcia, who also swore in Vela. Both new trustees were joined by their families during the ceremony and received standing ovations as their pledge ended. Incumbent trustees Oscar Salinas and Xavier Salinas were also re-elected for Places 2 and 5, accordingly, and were sworn in during the meeting. Xavier Salinas was sworn in by his uncle Alejo Salinas in the presence of a notary public. Oscar Salinas was administered the oath of office by District Judge Renee Rodriguez-Betancourt. The outgoing trustees also had the opportunity address those present and offer advice to those taking their seats. Former Trustee Palacios served on the board for eight years before losing the most recent election to Vela. During his exit remarks he said he had the opportunity to talk to incoming trustees to offer some advice before the meeting. His main message was to focus on their main goal and work as a team of eight.